Good morning sweeties!! It's Tuesday and you know what that means, it's time for SweetStamps weekly challenge. This weeks theme is my favorite...I use it all the time and it's a MOST have in everyone's cardstock collection. What am I referring to? For my card this week, I wanted to do something very clean and simple, yet gorgeous! So I stamped the beautiful Apple Blossom, using rich cocoa memento ink. The flowers have been colored with Prismacolor pencils. The edges of the cardstock has been inked with antique and walnut distress inks. This looks amazing !! Beautiful stamps and your coloring is fabulous ! Beautiful card! I love the stamp ! Calypso this is just beautiful! Such a clever way to showcase the stamp then adding the colors made the card extra special! So pretty and sweet, bravo! WOW! Such a pretty card! Love your use of the stamp!! 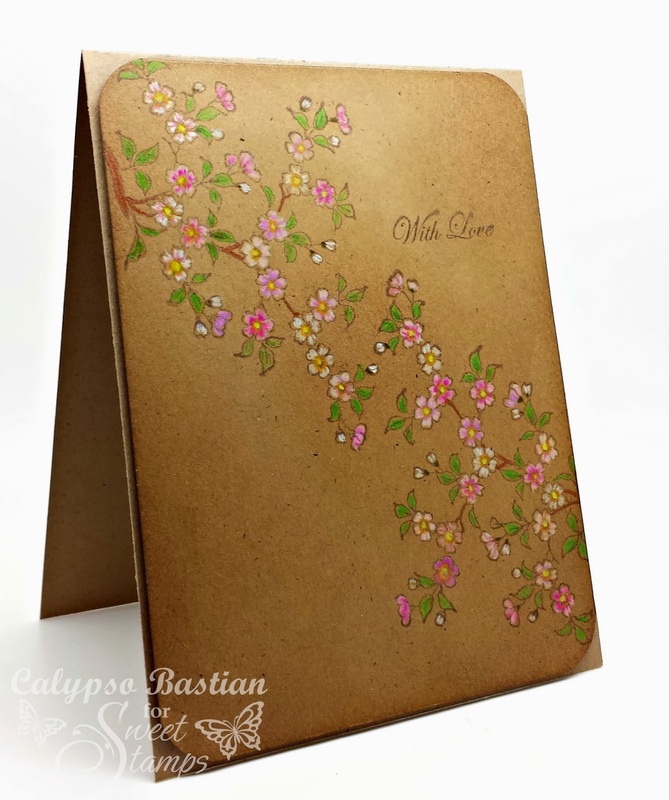 Wonderful card- your coloring of the blossoms- outstanding : ) Love the image stamped in brown ink too. Oh that is fab, Nazeema - kraft is just the perfect background for this pretty stamp, and you've coloured it so beautifully. Marvelous design, Calypso. It's simple and so very elegant. I'm a kraft nut too…it's my all time favorite for cards. This really turned out beautifully! Gorgeous coloured flowers! A super pretty card! wow wow wow!!! You have sold me on this stamp, I must have it now!!! LOVE the colors and the whole design! You know I'm a sucker for CAS, just beautiful! Beautiful design, I love the simple design and the colors of the flowers. This is such a lovely card! Very Oriental and so beautiful! Love that stamp. very Nive!